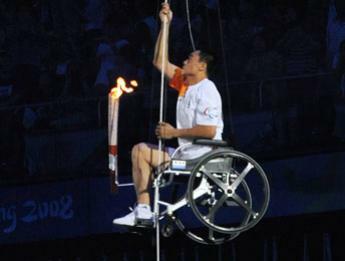 As impressive was Li Ning’s “flight” towards the Beijing Summer Games cauldron, the image of Hou Bin lighting the 2008 Paralympic flame after lifting himself and his wheelchair up on a rope by the strength of his arms, to the top of Beijing National Stadium, was simply inspiring. But honestly, that was the only piece of Paralympic news I paid attention then. I have wondered what kind of support this city will offer now that it’s our turn to host the Paralympic games. So it was quite heartening to read stories about people lining up to purchase Paralympic event tickets and their enthusiasm for what lies ahead. Certain members of the media even went as far as predicting success for these games. I do want to take this opportunity to send my well wishes to someone I know who was chosen as one of the Paralympic Torch Bearers. Even though I don’t know her that well, she’s been a blessing and an inspiration to me, and many, who had the privilege of watching her grow up. In light of the challenges she has faced since she came to this world, what she has achieved in her life was nothing short of amazing. And I’m very happy that she gets to experience this with her family and friends. The Paralympics is upon us. 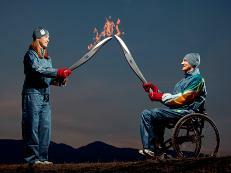 Come out and celebrate the human spirit and the determination of all the athletes who will be competing in these games. They are true heroes that deserve our admiration and support.